(WILLIAMSBURG, VIRGINIA) Velocity Urgent Care (http://velocityuc.spinmodern.co) announced today, that it will be opening its newest urgent care center in Virginia Beach Town Center, at the intersection of Virginia Beach and Independence Boulevards, caddy corner to Pembroke Mall and in front of the future Wegmans supermarket. The center will open for business on Monday, May 21, 2018 at 4701 Virginia Beach Blvd., Suite 210. This opening is the first of four new Hampton Roads urgent care centers that will be opening in 2018. Other locations coming soon are Suffolk (Centerbrooke Village); Norfolk (Wards Corner); and Hickman Place in the Red Mill/Nimmo Parkway area of Virginia Beach. Virginia Beach Town Center offers an unmatched selection of over 4 million square feet of shopping, dining, living, and office space to the residents and visitors of the area. Should injury or illness strike while enjoying the fine amenities that Town Center has to offer, high-quality medical care is just minutes away. Velocity Urgent Care offers no-appointment-necessary visits with friendly, licensed professionals, for the treatment of minor illnesses and injuries that need immediate care but are not severe enough for the emergency room. Each Velocity Urgent Care center is equipped to treat cold and flu symptoms, coughs, earaches, headaches, sprains, strains, fractures, minor cuts, scrapes, and rashes. Services also include on-site x-rays and common lab tests. Most insurance is accepted, but there is a “no surprises” self-pay option as well for those without insurance. 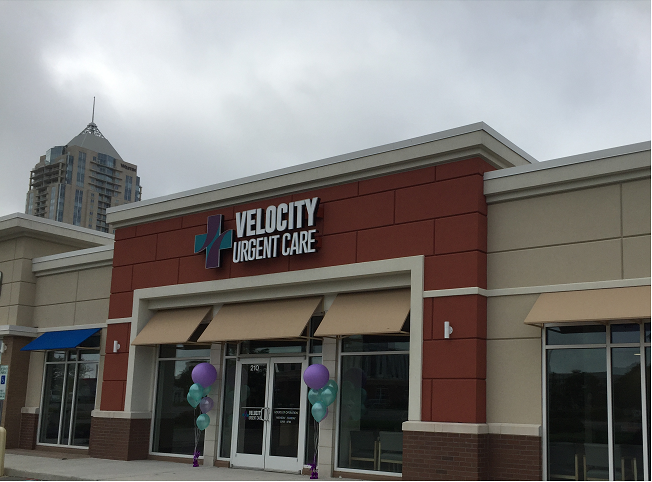 After acquiring seven Sentara Urgent Care centers in Hampton Roads in December 2017, Velocity Urgent Care is helping fill-in the market and provide tremendous convenience and accessibility for its consumers. The new location in Virginia Beach Town Center is open 7-days-a-week from 8:00am to 8:00pm. Most patients are in and out in less than 45 minutes, but Velocity Urgent Care centers are equipped with complimentary Wi-Fi, snacks, and beverages to keep things comfortable. Patients seeking care can reserve a spot online or simply walk in. Velocity Urgent Care currently has 9 locations in Virginia including Williamsburg, Virginia Beach (3), Carrollton, Gloucester, Newport News, Norfolk, South Boston with additional locations opening in 2018. Each center provides high-quality, walk-in medical services for illness or injury too severe to wait for a primary care physician but not severe enough to warrant an emergency room visit. Licensed medical providers treat the flu, cold, strep throat, rashes, dehydration, ear infections, concussions, sprains, strains, minor breaks and more. For more information, visit http://velocityuc.spinmodern.co.